The reciprocating movement mimics the movements that are bodies use for sawing by hand. If you think about it, we use the same body movements to do a number of other tasks. The problem with the reciprocating saw is that it can only do one task as is the case with most saws, and who wants a tool that can only do one thing. 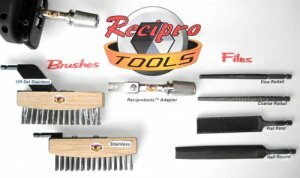 ReciproTools knows this, and have designed a number of attachments that can be used on a reciprocating saw, that will give your arms a rest, and make your reciprocating saw a better tool.